Shortly after reveille on April 7, 1846, American soldiers with shovels and pickaxes began construction of a permanent installation on the north side of the contested Rio Grande. Brig. Gen. Zachary Taylor, commanding the force sent the previous month from the Nueces River, commanded his troops to rotate out in shifts, leading to a near constant flinging of earth and debris. The armies were not the only ones paying close attention to each other’s battlements. As the American army arrived on the north side of the Rio Grande and ran up the Stars and Stripes, 2nd Lt. Napoleon J.T. Dana wrote that their flag “was answered by the flags of England, France, and Spain from the consuls’ houses in the city,” as the ambassadors hoped to avoid any crossfire. As the American soldiers went to work on April 7, they were overseen by Capt. 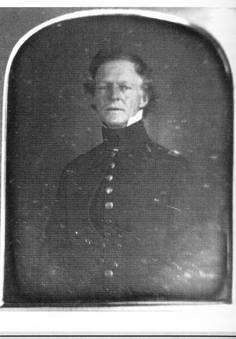 Joseph Mansfield, an engineer officer graduated from West Point in 1822 and the man who Taylor had specifically given the task of building the fortifications. Engineer Joseph Mansfield Oversaw the Construction of the American Fort. During the Civil War, Mansfield commanded the 12th Corps at the Battle of Antietam and was mortally wounded advancing towards the bloody Cornfield. intended the fort to house some 500 men. Officers and enlisted men alike worked on the fort. Twenty-six year old 2nd Lt. Alexander Hays, 7th Infantry and close friends with Ulysses ‘Sam’ Grant, wrote, “Incessantly by day, but with alacrity, our troops piled the pick and shovel, while in view across the plains of Matamoras [sic] squadrons of [Mexican] lancers and masses of infantry performed their evolutions.” The hard work continued for weeks, until by the beginning of May, only small pieces of the fort’s construction remained to be done. 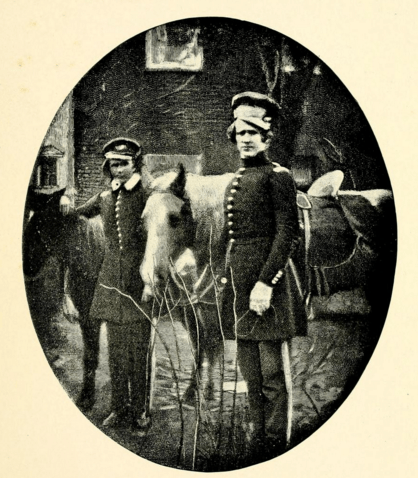 Lts Alexander Hays (R) and Ulysses S. Grant (L), about a year before the outbreak of the Mexican War. Hays was killed at the Battle of the Wilderness in May, 1864, greatly distressing his good friend Grant. Though Zachary Taylor wrote confidently back to his superiors in Washington, the impasse along the Rio Grande would soon turn violent, hurling the two nations into full-fledged war. The Papers of Ulysses S. Grant, Volume 01: 1837-1861, Edited by John Y. Simon, Southern Illinois University Press, 78. The Life and Letters of George Gordon Meade: Vol. 1, (New York: Charles Scribner’s Sons, 1913), 48. Monterrey is Ours! : The Mexican War Letters of Lieutenant Dana, 1845-1847, Edited by Robert H. Ferrell, University Press of Kentucky, 1990, 39. Douglas A. Murphy, Two Armies on the Rio Grande (College Station: Texas A&M University Press, 2015), 103-104. The Life and Letters of General Alexander Hays, 58. Messages of the President of the United State with the Correspondence, Therewith Communicated, Between the Secretary of War and Other Officers of the Government, on the Subject of the Mexican War (Washington: Wendell and Van Benthuysen, 1848), 133. 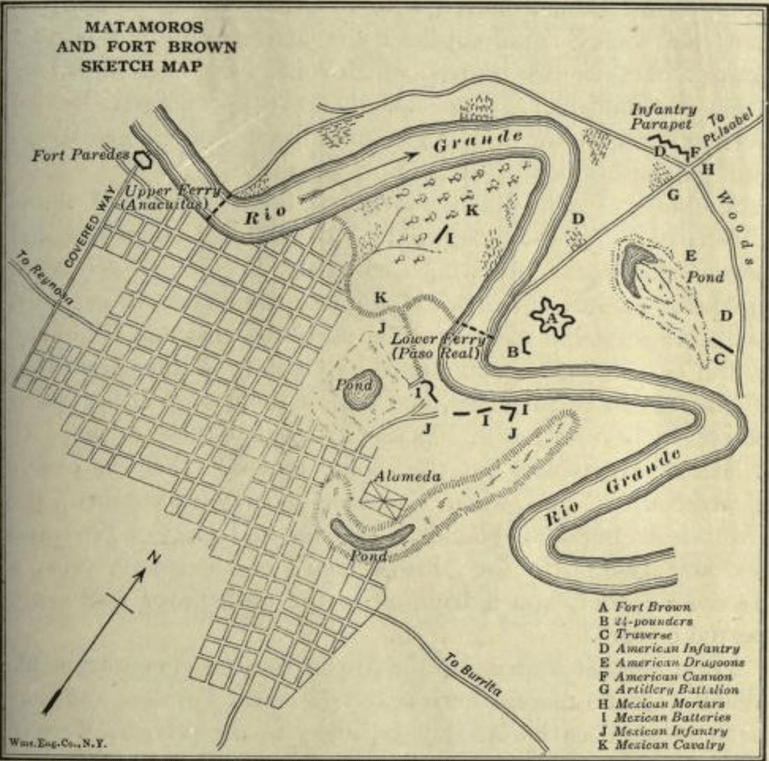 This entry was posted in Armies, Battles, Campaigns and tagged Alexander Hays, Fort Brown, George G. Meade, Joseph Mansfield, Matamoros, Mexican War, Mexican-American War 170th, Napoleon J.T. Dana, Rio Grande River, Ulysses S. Grant, Zachary Taylor. Bookmark the permalink.